Guitar brands are now listed alphabetically in six separate sections. A-style mahogany body & spruce top finished in gloss sunburst.20 fret rosewood fingerboard.For the "less traditional" player, the M510E features a magnetic pickup with volume and tone controls to make sure the incomparable sound of the mandolin can be heard in any venue.Includes our own shop setup(properly levelled ,crowned & polished frets,properly cut & lowered nut slots and bridge saddle for superb playability) as well as a zippered nylon gigbag.Ibanez page link. A-style all mahogany body top,back, sides & neck.24 fret rosewood fingerboard.Matte ,open pored finish..Includes our own shop setup(properly levelled ,crowned & polished frets,properly cut & lowered nut slots and bridge saddle for superb playability) as well as a zippered nylon gigbag. 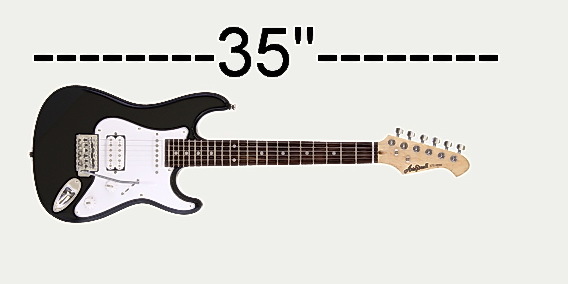 A surpsingly good instrument for this price range for the beginning player wanting better playability than too many disappointing yard sale/pawnshop disasters.A maple neck hat can actually be adjusted with a truss rod. adjustable bridge,double bound body and fingerboard with a properly applied gloss finish that defies it's afforable price.Final fretwork and set up is done in our own shop and we include a padded gigbag as well-an excellent value that won't melt your debit card ! In stock in vintage sunburst and redburst. We stock one of the largest selection of "mini-guitars" around.These are not kiddy toys,although these instrument's shrunken dimensions are easy for little Satrianis to handle and learn on.These well built guitars have been carefully selected by us AND are setup in our shop to play effortlessly,unlike most "little guitars" you'll see elsewhere.We've taken the time work out the optimum string guages and intonation so these guitars can be played at normal pitch. These guitars are great for travelling,backpacking,college kids in dorms,hotel rooms or da-back-of-da bus with dat! Their compacted size make them great for sticking in a locker at school or work or a good choice when you don't want junior beating the tar out of your high end guitar-let the next "Stevie Ray" play one of these instead-you'll thank us! 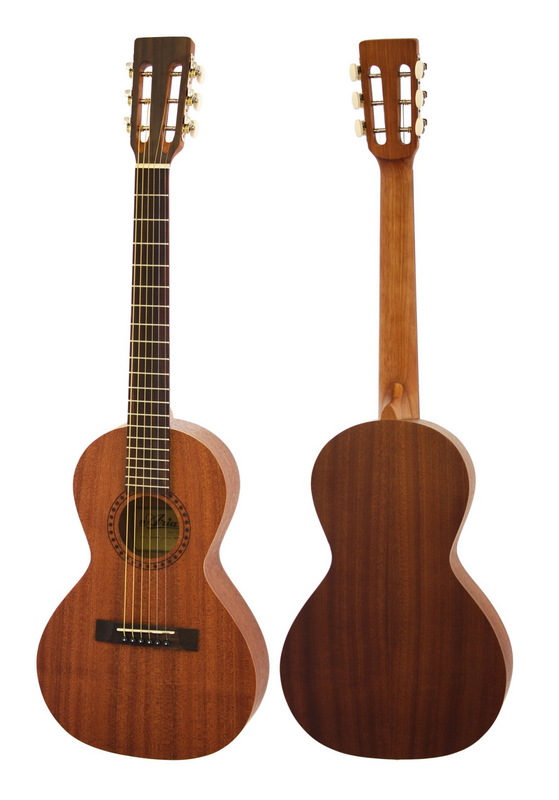 Even though the new Aria ASA could be easiily mistaken for a children's guitar,it's actually a very high quality parlour style travel acoustic (that yes,is also more than suitable as a child's guitar as well. )The ASA's compact 36 inch length and slim body makes this a great choice for camping trips,improptu jams,backpacking,etc.The slim mahogany necj features 20frets(expertly levelled,profiled and hand polished in our own shop),smooth action vintage style tuners that don't slip and detune. The back & sides comprise of African Sapelle and the mahogany top sports a very nice etched soundhole rosette.The Nubone nut and compensated saddle are cut and shaped in our own shop ,allowing the best playability,easily superior to any sold elsewhere.As part of our shop set up we also replace the harsh,britlle sounding stock strings with Phosphor bronze types that improve the bass response sustain and overall tone as well. Aria has upped the ante in the ST-style "junior" guitar market, with their new MiniCaster.Measuring only 35 inches,this 22.5" scale little terror sports a bridge humbucker for cranking out some hard driving crunch,as well as a single coil pickup in the neck position for peeling off some clean bluesy tones.A real rear-block-strung vibrato unit and six saddle bridge, along with our own custom shop set-up,revoiced tone control and shielding ,add up to make this one of the best playing and versatile travel guitars you'll find anywhere.Not only is this a great "little backup" for your regular electric,but also an excellent real alternative choice to all the nasty playing kiddie guitars-this is something your son or daughter will actually like playing ! View1 View2 Price includes our own custom shop set-up.re-voiced tone control,shielding,and TWO YEAR free,seasonal maintenance coverage. Gigbag included. 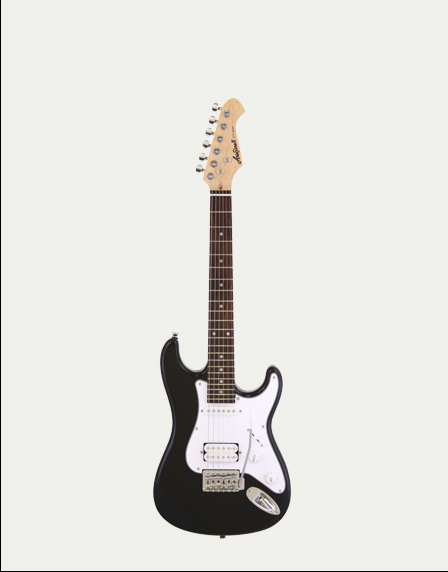 The ESP KH Junior is a 3/4 inch scale version of the KH202 with a tune-o-matic bridge and string-thru body. The maple neck has 22XJ frets and sports the same skull & bones inlays as the KH202. The basswood body is loaded with EMG-ESP LH300 pickups and has Volume and tone controls with a 3-way toggle switch. Our price includes our custom setup,revoiced tone control and logo'd gigbag. The Shorty’s overall length of 32.5” makes it an easy stowaway travel guitar, even a a backup or go-to guitar for rehearsals and pickup gigs.That,and your back won’t be aching after three hours of playing it ! Specially priced at $199.00 including logo’d gigbag , and our shop setup, in GLOSS BLACK only. With it's 22.8 inch scale length and downsized dreadnaught body,this little beast can crank out some superb tones,also thanks to it's SOLID mahogany top.The open pore,satin finish lets the entire body respond with a nicelyeven voice.Features a rosewood back & sides and a rosewood bridge with a compensated saddle.The mahogany neck sports a set of diecast,adjustable machine heads.The onboard chromatic tuner also speeds up tuning ,on the fly. Our price includes our own custom shop setup:professionally levelled & profiled frets,contoured fretboard edges,superior string action set up for superb,effortless playability,premium level padded gigbag and,TWO YEAR free,seasonal maintenance coverage. Solid Spruce top,with inclusion of the Fishman Isys+pickup system with active volume,treble and bass controls.A separate phase control helps reduce unwanted feedback onstage.The Isys+ also features a chromatic tuner with a mute function,as well as a low battery indicator.Our price includes our own custom shop setup:professionally levelled & profiled frets,contoured fretboard edges,superior string action set up for superb,effortless playability,premium level padded gigbag and,TWO YEAR free,seasonal maintenance coverage. Now with Solid spruce top, Back & Sides made of a 3-layer lamination of real hardwood. Other features include a burn stamped rosette and semi-gloss Custom Polished finish.Our price includes our own custom shop setup:professionally levelled & profiled frets,contoured fretboard edges,superior string action set up for superb,effortless playability,premium level padded gigbag and,TWO YEAR free,seasonal maintenance coverage. 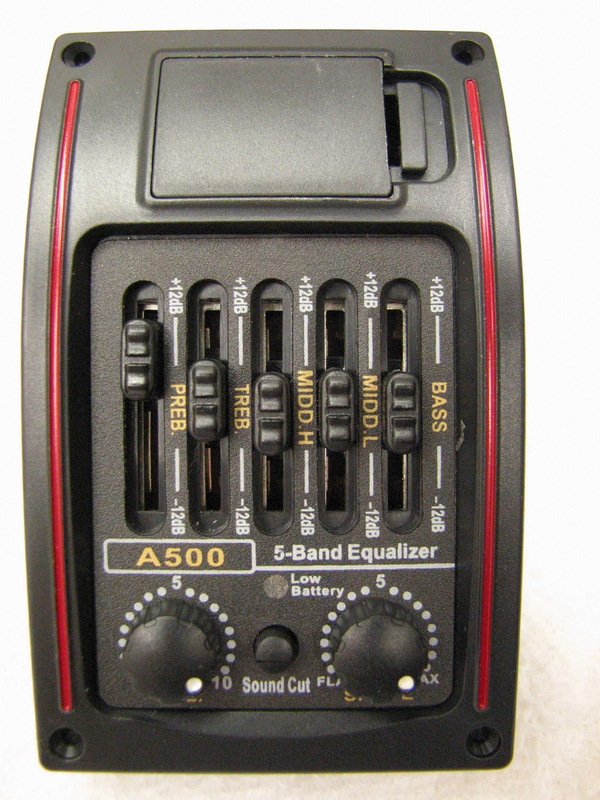 Same features as the model above,with inclusion of the Fishman Isys+ pickup system with active volume,treble and bass controls.A separate phase control helps reduce unwanted feedback onstage.The Isys+ also features a chromatic tuner with a mute function,as well as a low battery indicator.Our price includes our own custom shop setup:professionally levelled & profiled frets,contoured fretboard edges,superior string action set up for superb,effortless playability,premium level padded gigbag and,TWO YEAR free,seasonal maintenance coverage. Wild cherry top,indian rosewood fingerboard & bridge,wild cherry sides & back.Tusq compensated saddle & nut.Sealed,adjustable,die-cast tuners, Fishman classic 4 pickup system.Wine red satin laquered finish. The B18-12 is the 12-string version of the B18 6-string model, delivering a beautiful shimmering 12-string sound that players have come know and love from a traditional 12-string acoustic steel string such as this. It features a solid cedar top that yield sa warm,sweet tone.The back & sides are made of a stron,resilient,3-way lamination ofCanadian wild cherry.The rock maple stained neck is capped with a rosewood fingerboard.The die-cast tuner & Graphtech nut adds to the guitar's tuning stability.Finsihed in a smooth low lustre satin laquer finish that "breathes" more organically as it ages and actually improves the guitar's tone over the years.Our price includes our own custom shop setup:professionally levelled & profiled frets,contoured fretboard edges,superior string action set up for superb,effortlessplayability,premium level padded gigbag and,TWO YEAR free,seasonal maintenance coverage. The B18 CW Tobacco 4T is a great option for the performing musician. 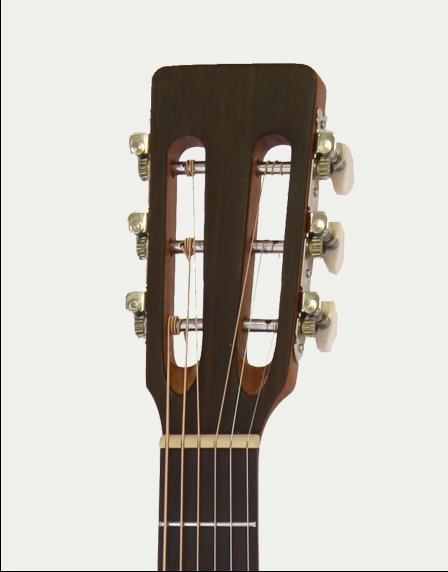 It features a cutaway (CW) ideal for acoustic solos, allowing for easy access to the upper frets of the fingerboard on the neck. It also includes Fishman Classic 4T electronics with built-in tuner, onboard preamp and under-saddle tranducer for quality plugged-in live sound. Features a solid cedar pressure tested top with Canadian wild cherry back & sides.rosewood fingerboard and bridge.Graphtech compensated saddle and Graphtech Tusq nut.Diecast,sealed tuners.Our price includes our own custom shop setup:professionally levelled & profiled frets,contoured fretboard edges,superior string action set up for superb,effortless playability,premium level padded gigbag and,TWO YEAR free,seasonal maintenance coverage. Solid cedar top,wild cherry sides & back,rosewood fingerboard & bridge.Tusq compensated saddle & nut.Tobacco sunburst laquer finish. With the same outstanding sound and features found throughout the B20 series, this model represents an opportunity to enjoy a fully professional sound and feel in an affordable 12-string guitar with unmatched stability. Featuring a select solid spruce top for enhanced clarity & projection,silverleaf maple neck,wild cherry back & sides for sweetened tone.Our price includes our own custom shop setup:professionally levelled & profiled frets,contoured fretboard edges,superior string action set up for superb,effortless playability,premium level padded gigbag and,TWO YEAR free,seasonal maintenance coverage. Select solid spruce top,silver leaf maple neck with rosewood fingerboard. Wild cherry sides & back.Graphtech compensated saddle and nut.Sealed, adjustable,diecast tuners. Natural,satin laquered finish. Our price includes our own custom shop setup:professionally levelled & profiled frets,contoured fretboard edges,superior string action set up for superb,effortless playability,premium level padded gigbag and,TWO YEAR free,seasonal maintenance coverage. 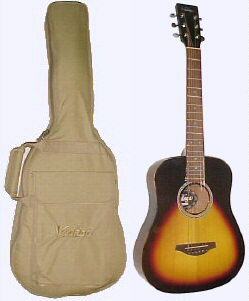 The B20 CW is the cutaway version of the B20 model. Excellent for players who want to have access all the way up the fingerboard. It features wild cherry back & sides, a semi-gloss Custom Polished finish and a select pressure tested solid spruce top. Our price includes our own custom shop setup:professionally levelled & profiled frets,contoured fretboard edges,superior string action set up for superb,effortless playability,premium level padded gigbag and,TWO YEAR free,seasonal maintenance coverage. Same features as above with the addition of the Fisman PreSys pickup system with built-in chromatic tuner.Fishman’s Isys Onboard Preamp Systems are dedicated to providing maximum value in a small footprint. Available in three models, these preamp systems feature Volume, Tone shaping, and Phase controls; a pre-wired Fishman Sonicore pickup and low profile control knobs. Also included are a low battery indicator and a separate battery box.Our price includes our own custom shop setup:professionally levelled & profiled frets,contoured fretboard edges,superior string action set up for superb,effortless playability,premium level padded gigbag and,TWO YEAR free,seasonal maintenance coverage. Same features as above but with the inclusion of the Fishman Presys undersaddle pickup system and built-in chromatic tuner.Our price includes our own custom shop setup:professionally levelled & profiled frets,contoured fretboard edges,superior string action set up for superb,effortless playability,premium level padded gigbag and,TWO YEAR free,seasonal maintenance coverage. Not only is the B50 acoustic-electric a stunning beauty with its flame maple back & sides and high-gloss Custom Polished, but combined with a solid spruce top this guitar can really cut through a live mix due to the brighter tones of spruce and maple.Fitted with a Fishman Isys undersaddle pickup and preamp with onboard chromatic tuner.Our price includes our own custom shop setup:professionally levelled & profiled frets,contoured fretboard edges,superior string action set up for superb,effortless playability,premium level padded gigbag and,TWO YEAR free,seasonal maintenance coverage. The warm and smooth tone of the Studio series ST40 comes from the combination of its mahogany back & sides and solid cedar top. The semi-gloss Custom Polished finish allows the wood to breathe and vibrate freely which promotes a higher level of acoustic tone, the more the guitar is played over time..Tusq nut & compensated saddle . Solid cedar top,mahogany neck with rosewood fingerboard and bridge Fishman under saddle pickup & Fishman Classic 4 preamp-equalizer . All our "straight" acoustic guitars(or yours) can be retrofitted in our custom shop with any variety of under-saddle pickup and pre-amp systems,including the A500 System with a true 5-band equalizer delivering robust,tight bass,silky smooth,transparent mids & crystal clear high end response along with dual variable mid-freq to help tame nasty feedback,as well as a mute function and low battery indicator. Ask Gilles for a quote. Already own a Norman or, recently purchased one elsewhere that doesn't seem to play right? Chances are it has to be set up properly so you get the optimum playability and tone from it .WE know how to set them up just right. Put our 40+years of guitar repair expertise & customizing experience to work for you, like so many players already have!